Truck Driver Shortage. What Should Shippers Do? 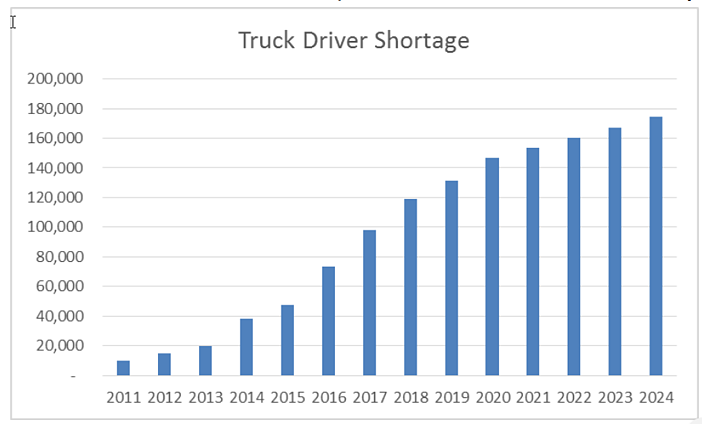 There may be debate over the scale of the problem, but there’s no question the U.S. is currently suffering a severe truck driver shortage. Let’s take a look at the problem, how it came to be, what it means for carriers and, most importantly, what shippers can do to ensure well-priced freight capacity in this changing market. Driver shortages have been a problem since the 1980s, when deregulation sparked a jump in the number of trucking companies. But shortages have gotten more pronounced in the last two years. The chart below, from the American Trucking Association, estimates the long-term scope of the challenge. In 2014, the last year for which many official statistics are available, the Federal Motor Carrier Safety Administration (FMCSA) counted 3.9 million people with the commercial driver’s licenses needed to operate tractor-trailers or other heavy-duty trucks. That sounds like more than enough to cover the estimated 1.6 million active drivers needed, but a 2015 American Trucking Associations report estimates the U.S. is short at least 48,000 drivers today, and the ATA estimates that the shortage could rise to 175,000 by 2024. Several factors are deepening the driver shortage crisis. Fewer people are drawn to driving as a career. Retention is a huge issue, with a near-100 percent annual turnover when the industry is taken as a whole. Many, it seems, try it out and decide it’s not for them. Further, truck drivers aren’t getting any younger. Although millennials have overtaken other age groups as the largest segment in the U.S. labor force, the number of people working in the trucking industry between the ages of 25 and 34 has dropped by 50 percent since 1994, the American Transportation Research Institute reports. Indeed, truck transportation employees’ median age is now 46.5, compared with 42.4 for the total U.S. workforce. That number is rising, implying a “truck-driving generation” that is well on the way to retirement with no replacement coming behind. There is an effort to get Congress to lower the minimum age for big-rig drivers. But 18-year-old drivers are not the answer, as KANE argued in this Journal of Commerce editorial. Another target demographic for boosting the numbers is women, who currently represent only 5.8 percent of truck drivers in the U.S. (up from 4.6 percent in 2010). Tractor manufacturers are paying heed to a demand for more women-friendly equipment. Each truck driver is likely to drive a little less in the near future. The U.S. Department of Transportation’s FMCSA Final Rule requiring the use of electronic logging devices (ELD), which will come into effect in spring, 2018, means federal hours-of-service rules for commercial drivers will be rigidly enforced. Implementing manual log-in systems typically reduces “productivity” (meaning hours) 14-18 percent. Across-the-board enforcement will effectively reduce the amount of driving time per driver, nationwide. There will be more freight to move. As the economy continues to expand, more goods made and sold will mean more freight, which in turn will mean more trucking. Nearly 70% of all the freight tonnage moved in the U.S. goes on trucks. Demand is only going to rise. Strangely, some say the problem will go away completely within the next 10-25 years because self-driving trucks are already being road-tested in both California and Europe. Otto, the company set up by former Google execs to develop autonomous commercial tractor-trailers, was bought by Uber in August 2016, leading Time Magazine to conclude that self-driving trucks “may be the next big thing on the road”. But, while we wait for this future to become a reality, both trucking companies and their customers must carefully consider strategies and tactics in order to stay competitive in this strained marketplace. Some carriers won’t move lower-cost commodity freight because there is higher-margin freight out there to be had. Carriers are telling shippers they can’t guarantee all their freight is going to move, even at agreed prices. Carriers can shrink the time limit on price guarantees – even to under a year. All this is leading to a resurgence of dedicated freight contracts. Nestle and Anheuser-Busch are just a couple of mega shippers that have shifted to freight strategies that guarantee available capacity. The uncertainty of being able to move freight at all is perhaps the biggest concern for shippers, and it requires a mental shift away from price and other metrics when it comes to buying freight services. If product doesn’t get where it needs to go because of driver shortages or other reasons, every other consideration is moot. On the other side, carriers struggling to deal with the truck driver shortage are being forced to make changes that can require tricky reworking of the network, increased expenses and reduced profits. Offering state-of-the-art trucks makes carriers more attractive to drivers. The average age of Kane Is Able’s fleet, for instance, is two years. Carriers that pay drivers for idling time has become another way for drivers to distinguish one carrier from another. Carriers may literally shrink the geographical reach of their service networks, so that drivers have a better chance of sleeping in their own bed at night. Pay more. Higher-paying carriers get and keep drivers more easily. Clearly, carriers like Kane Is Able are adapting, but there is a cost. Further, the shift to dedicated carriage contracts, while giving carriers a guaranteed deployment of their valuable assets (equipment and drivers) means the rates tend to be lower than in lane-based contracts, where carriers take the risk of having spare capacity in exchange for higher rates. Driver shortage: How can shippers adapt to this new world? For both carriers and the owners of freight, the smart move is to resist all temptations to see freight as a mere commodity. It never has been, and it never will be. There are simply too many factors involved that make an impact on the end result – when your freight turns up, how it turns up, what state it’s in, who’s there to receive it, how it moves on from there. Service still counts a great deal. Clinging to strategies that have served in the past is not the way to go. For instance, many shippers still churn out massive freight RFPs every year, old-school style, expecting carriers to compete with one another to produce lane-based pricing for all that shippers’ freight requirements, set for three years. But the days of shippers relying on multiple carriers to eagerly bid for their business are gone. For shippers seeking to secure freight capacity in the current market, here are 6 ideas to navigate the driver shortage situation. You may find that you won’t be able to move your freight at all as carriers seek more profitable freight. Even the biggest manufacturers and retailers are seeing situations where they cannot get freight covered. Often, internally, the purchasing department is driving the bid process. But the logistics people responsible for getting product to market understand the trade-off between cost and value, and need to be involved more than ever. Instead of bidding out freight on a nationwide basis, look at segmenting bids by region. Move away from the Big Bang approach, offering all freight to all bidders. Focus on key carriers in these regions, rather than spreading your net as wide as you can. As mentioned above, many carriers are shrinking their networks geographically to offer drivers better conditions. Understanding where you need capacity and knowing the regional carriers in this space are good advantages. The regional guys can better control how they manage their assets. They can guarantee capacity, plus they provide more of a personal service. Be a smart buyer – use metrics. Negotiating freight terms should never be just a price play. You should demand certain performance levels (damage, on-time delivery, service, etc. ), and you should measure them closely, building up a history. If you run a TMS system, you know these metrics for key carriers. These numbers make it very clear to shippers who the quality carriers are, by performance. In a capacity squeeze, there’s nothing more inexcusable than a half-empty truck. Look for carriers that can combine your freight with other shippers moving to the same delivery points. Have systems in place to identify when freight is moving from your area to the same points as another shipper in your area or one serviced by your carrier. If the receiving or loading docks at your DCs are congested, tying up truck drivers for hours while they wait their turn, carriers are less likely to make an effort to serve you. Making and keeping time windows is helpful. So is communicating constantly about operational issues that have any bearing on delivery and pick-up. There is huge value to building relationships with carriers. Treat carriers more as partners and communicate regularly to proactively tackle short- and long-term challenges. When fighting to ensure capacity, relationships count for a lot. What is your company's attitude toward freight? Often, it comes down to a shipper’s attitude toward freight, in general. Some view transportation as a mere commodity; some view it, rightly, as a competitive advantage. Your own view will color your ability to manage freight costs and build valuable partnerships with your carriers. In the coming years, as the driver shortage gets deeper, those partnerships will be more important than ever before.